MOSCOW, April 4 — RIA Novosti. Dozen of church bells from landing symbols consecrate April 7 at the Orthodox Church in Moscow's Sokolniki, told RIA Novosti on Thursday, the Defense Ministry spokesman on airborne troops (VDV), Colonel Alexander Kucherenko. According to him, the first time the church bells in the casting, in addition to images of the saints, were decorated with the emblems and symbols of the landing of the Armed Forces. 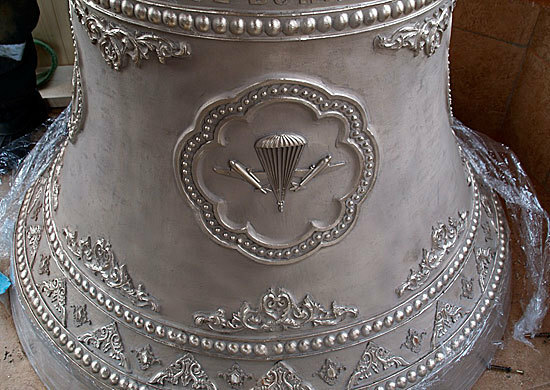 "Sunday in the church of the Annunciation monastery of Patriarch of Moscow and All Russia at the headquarters of Airborne at Sokolniki will be performed the rite of lighting 12 bells, cast by means of voluntary donations paratroopers, combat veterans and counter-terrorism operations, members of their families," — said Kucherenko. Bells with airborne hoist symbols on the bell tower of the main cathedral Airborne. "On the bells were cast images of icons of saints, which links the name day of all the commanders of the Navy, with the help of which was revived this temple. At Georgy Shpak is Saint George the Victorious, Alexander Kolmakov — Saint Alexander Nevsky, Vladimir Shamanov — St. Vladimir" — gave Kucherenko words of the priest, Fr Michael Airborne (Vasiliev).